Track Night will be at Santa Monica College tonight! Notes: This bottom position should be as deep as possible while still maintaining quality lumbar extension and rack position. While CrossFit is simple to define: constantly varied, functional movement at high intensity. The reality of implementation becomes a bit more complex: nutrition, recovery, warmups, learning proper technique/scaling/progressions, addressing mobility limitations, past injuries, etc. A cornerstone of what we are trying to teach is that there is no “one right way” to deal with these different aspects of your training regimen. In other words, we are all unique individuals! Our goal is to give you the tools and resources to find your own answers. This is the concept of self experimentation and the test/retest ideal. I say as often as possible that the Mobility/Warmup segment of class is a guideline and that it is more important to do what works for you. For the newer athletes, these guidelines are a great place to start, but as time goes on, you should be able to pinpoint what is working and what is not. Looking at today’s workout for instance, the strength portion is front squats, so we prescribed rolling out your lats to assist with the rack position and a couple hip prep movements to improve your torso position in the bottom of the squat. But for some people maybe it is not the lats that are the limiting factor for a quality rack position, but rather the thoracic spine or the triceps. 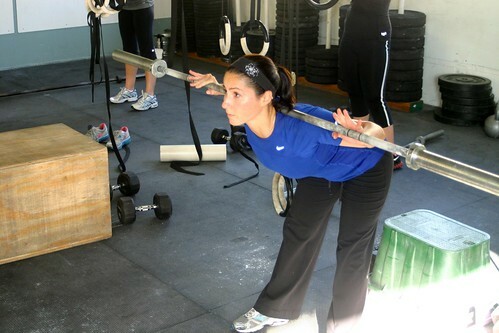 Are those hip mobility drills actually improving your squat position? While they’re not hurting you, we only have a limited time in class, so we should be as productive as possible. We might not say it often enough, but take the time to try a movement before a particular mobility drill and then re-test it afterwards. Did it help?! If yes, keep doing it! If not, move on to another drill! We can take this simple self-experimentation concept and apply it to every aspect of our training. Remember, there is no “one right way!” Yes, there are generalities that relate to us all: quality food choices, high intensity exercise, proper movement, good sleep, etc. But the devil is in the details. How long before a workout do you prefer to eat? How many times a week do you attend class? What do you do outside of class? What warmups/cool downs allow you to continue training regularly? There was an interesting video on the mainpage on this topic. Keep collecting data and keep experimenting!